When truth collides with fiction, who can you trust? INpulse Theatre Co. presents the Toronto premiere of Trevor Schmidt’s Mockingbird Close, directed by Ryan F. Hughes and running at Red Sandcastle Theatre. Iris (Tiana Leonty) and Hank (David MacInnis) live in a nice, clean split-level home on a nice, quiet cul-de-sac in a nice, safe, crime-free neighbourhoood. Their picture-perfect 1950s suburban life is turned upside down when their young son goes missing. Only, when they try to recall the day he disappeared, they can’t seem to get the story right. As they conduct a door-to-door search on their street—the titular Mockingbird Close—we encounter their neighbours (all played by Leonty and MacInnis); and it’s dark comic portraits all around as we meet them. The vain, judgmental, hyper-religious, baking Lois Vent. Sidney Blackwell, the strangely charming older man with his prized train set in the basement and a bed-ridden wife upstairs. The attention-starved, “Mrs. Robinson” Mona Hobbs. The odd, soft-spoken Jarvis Jermaine. No one has any information on the missing boy—and all are concealing something. And then there’s the malevolent, mysterious older lady; the one the neighbourhood kids call “the witch.” There’s a dangerous, unsettling undercurrent on this street; and each of its inhabitants has a dark, hidden edge. Incorporating storytelling with satirical fetishization of normalcy and wholesomeness, Mockingbird Close is part fairy tale, part psychological thriller—one might even say David Lynchian. What really happened? And did it even happen? Leonty and MacInnis are a two-person master class in their performances, playing on the edge of send-up and nuance as they flesh out these secretive, discomfiting characters. Leonty’s Iris is a neat, prim and somewhat high-strung wife and mother; the perfectly coiffed wife in an emerald green cocktail dress who greets her returning husband at the door with slippers, the paper and a martini. And Leonty runs the gamut, from narcissistic and controlling Lois to desperately lonely seductress Mona. MacInnis is the picture of the flawlessly pressed professional and husband; precise and socially astute, he too is tightly wound—more of the ticking time bomb variety. He is eerily engaging as Sidney and creepily attentive as Jarvis. MacInnis and Leonty seamlessly tag team a single character as they take turns portraying the mysterious and manipulative dark lady behind the final door at the end of Iris and Hank’s search. The secret thoughts of grownups and the stories they tell in the gripping, tension-filled, darkly funny Mockingbird Close. Mockingbird Close continues at Red Sandcastle until September 16; get your advance tickets online or at the door an hour before show time. Advance booking recommended; it’s an intimate space and last night’s opening was a packed house. 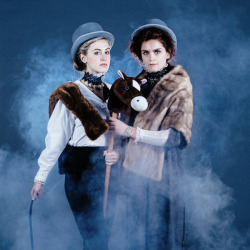 My second opening night show at the Next Stage Theatre Festival (NSTF) in the Factory Theatre Studio last night was The Templeton Philharmonic’s production of Gwynne Phillips’ and Briana Templeton’s sketch comedy romp Unbridled and Unstable. From the moment they appear through the mist astride their noble steeds Dvorak and Duchovny (riding side saddle, of course), Philips and Templeton take the audience on an engaging, satirical ride of sketches: Victorian equestrian ladies, a book club discussion, a 1950s amateur foley artist radio show, a real estate agent’s absurd home showing and audience participation horse racing. Drawing on psychological dramas and thrillers of the 50s and 60s, Phillips’ and Templeton’s voice and diction work is spot on. Most of the sketches are two-handers, but the gals break out for solo efforts: Templeton’s hilarious historic romance novelist reading, and Phillips as the drunken and inappropriately frank Aunt Gloria, staggering down memory lane as she describes the photos in a family album to the kids. Throw in some wacky fun dance breaks – with nods to disco, Michael Jackson’s Thriller video and Truly Scrumptious’s music box doll from Chitty Chitty Bang Bang – and you’ve got one ripping good time. Added bonus: Templeton Philharmonic merch is available for purchase before the show and the program notes include saucy renderings of horses by Philips, Templeton and SM/Associate Producer Vanessa K. Purdy. Unbridled and Unstable is a big, rhapsodic fun trip though some sharp-witted and highly entertaining sketch comedy. Somewhere, Dorothy Parker is raising a martini glass to these two wacky, smart and fun-loving gals. Unbridled and Unstable continues in the Factory Theatre Studio until Sun, Jan 18 – with a talkback at The Hoxton following the show on Sun, Jan 11. Click here for advance tix.